We caught up with SAI Barcelona Program Coordinator Leticia, who is contributing to our blog this month. 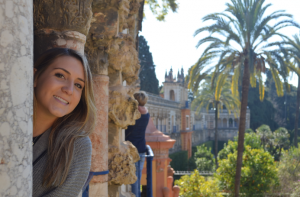 Leticia recounts her weekend student excursion to the sunny, southern town of Seville. I have lived in Andalusia for a few years and I have explored Spain’s southern region several times. 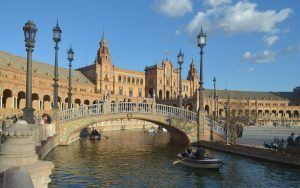 I was certain that the beauty of Seville and its cultural heritage would fascinate our SAI students as much as it fascinates me every time I visit the South. February was the perfect time for our inclusive weekend excursion to Seville because the city wasn’t suffocated by tourists yet, as it usually happens during the warmest months of the year. Also, we could still enjoy the charming magnetism of Spain’s fourth largest city. 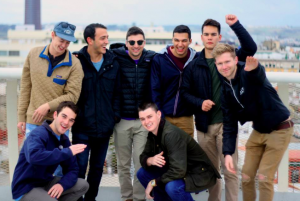 On February 2nd, the SAI Barcelona team and all 41 students embarked on a five and a half hour journey to Southern Spain. The plan was to take a train from Barcelona-Sants Train Station early in the morning to Sevilla-Santa Justa Train Station. We were so thrilled to see how such a different group of people would bond together and how they would encounter such a different culture from Northern Spain! The train journey was a fun experience for our students, riding the rails from North to South, just the way Europeans love to travel. It gave us the chance to see a lot of beautiful scenery, from snowed regions to the sunny Andalusia. 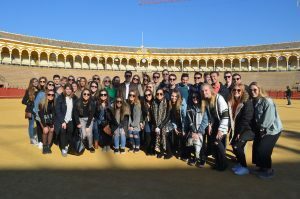 Seville finally welcomed us with its abundant sun and warmth, matching perfectly with the enthusiasm of the whole group as they prepared for the upcoming activities. As soon as the whole group was on their bikes the guides took us around the main places in the old town. 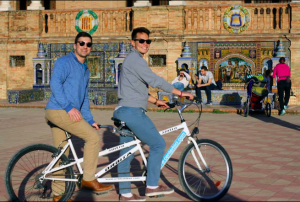 It was very entertaining pedalling through the stone pavements of the city while seeing the historical buildings and squares of this Andalusian town for the first time. We had already fallen in love with Seville by the time we arrived to our last stop, Plaza de España, located in the Parque de María Luisa. It is an architectural ensemble that was built in 1928 for the Ibero-American Exposition of 1929 and mixes elements of the Renaissance Revival and Moorish Revival of Spanish architecture. It is a must in the city! There you can find improvised Flamenco performances or guitarists playing for locals and visitors. We had such a great time! We learned a lot about the history of the city from the guides, two of our students rode a tandem bicycle, and we took tons of pictures and caught the best lighting; a stunning sunset that accompanied us throughout the last ride alongside the Guadalquivir River, the Torre del Oro, and the Triana bridge. After that, we finally went back to the hotel to rest for a few minutes and get ready for dinner. A few streets away, a Mediterranean style restaurant welcomed us for dinner. Both the students and the SAI Barcelona team talked, laughed and enjoyed the Sevillian night atmosphere with their new friends while everyone got a seat at the table. Just like the locals, we experienced a beautiful moment that reminded us that our students were completely immersed in our culture. During the whole weekend our students tasted a range of different local and delicious foods that all the group loved! During the second day of our weekend excursion we visited the Real Alcázar, the Cathedral, and the Giralda, Sevilla’s main attractions. This time, Pilar and Mercedes, our guides, told us the history of these majestic buildings with tons of anecdotes. Did you know that the Cathedral of Seville is the third largest Christian temple in the world? And that part of Christopher Columbus is resting in the Cathedral? (Yes, you read well, part of him). And that the Real Alcázar is one of the oldest palaces in the world still in use? It was a big surprise to find out that this fortified palace appeared on the world famous HBO show Game of Thrones as one of the palaces of Dorne. This anecdote helped to bring even more attention to our lovely guides! After lunch time we visited La Mestranza, a bull ring still in use and an emblem for Seville’s folklore. We took a great group photo there and the rest of the afternoon our students had free time to rest and to go shopping in the center of Seville. If you go to Andalousia you cannot miss one of its most famous traditions: Flamenco. We went to the Museo del Baile Flamenco (Museum of Flamenco Dance) to see a show that fascinated our students. Two singers, one guitarist and three dancers offered a magnificent show that made our night very special and our trip unforgettable. After the show, our students had free time to enjoy the vibrant night of Seville. If there is something you really want to learn from the locals it is that leisurely way of enjoying life, no matter if it is in a beautiful Spanish square, in a crowded local eatery during the day or night, with your family or with your friends. In our case, those you have met abroad. Our last day in Seville we visited Las Setas, where part of the group joined us to see this wooden structure located at Encarnación Square, the largest one in the world. Here, you can walk on top of las Setas to enjoy one of the best views of the city! This weekend excursion to Seville was a highlight not only for our Spring 2018 students, but for the SAI Barcelona team too. We are sure that the knowledge and the moments gained from this trip will be remembered forever, and at SAI Barcelona we are more than happy to make it possible!